To place a call, touch the call button in the on the upper tab bar in Android or the lower tab bar in iOS. This will open the standard phone dialer where you can enter any number to call. 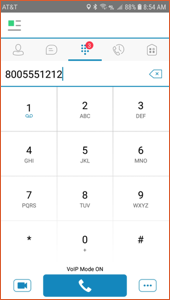 To use the dialer above, start typing a phone number by touching the numbers. Choose either the video camera at the bottom left to place a video call from your client or the middle larger button to place an audio call from your client.